I’ve been bit by the travel bug and just itching to return to one of my favorite places in the world, Turkey. Granted, we just welcomed our second baby so that might not happening tomorrow as I might have hoped. So what better way to fulfill a desire than through your belly?! 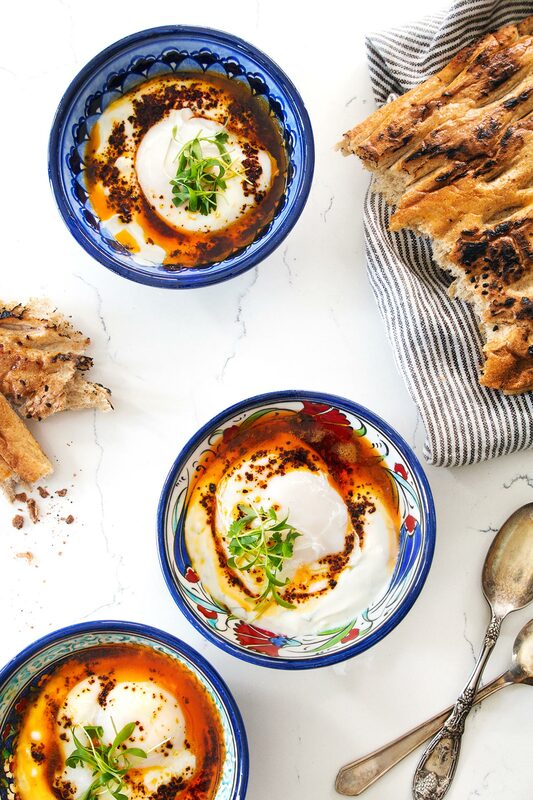 I’ve been craving Çilbir, a Turkish dish that has been enjoyed as far back as the 15th century by Ottoman sultans. 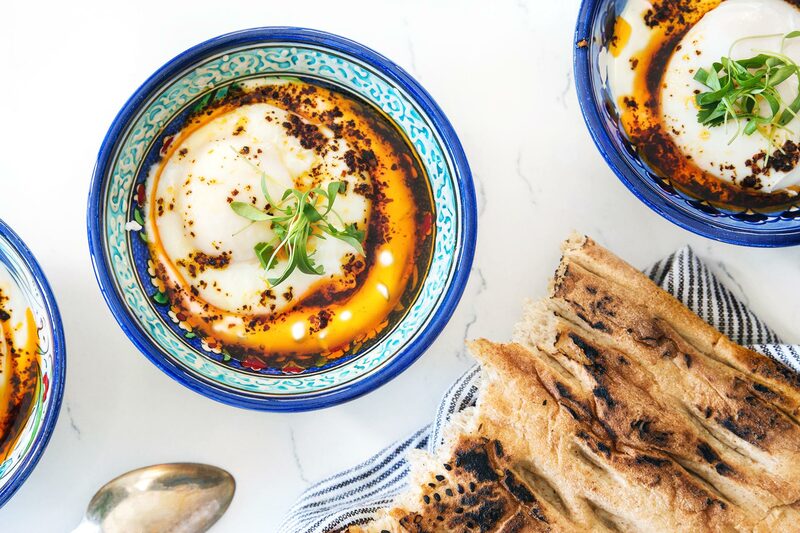 The combination of garlicky, herbed yogurt and poached eggs is unusual but surprisingly delicious and wonderfully comforting. The addition of an Aleppo pepper infused butter absolutely makes this dish, infusing just the right amount of mild spice and fragrance. Mop up the goodness with some warm, crusty bread and . . . well, a trip to Turkey can wait. At least for now. 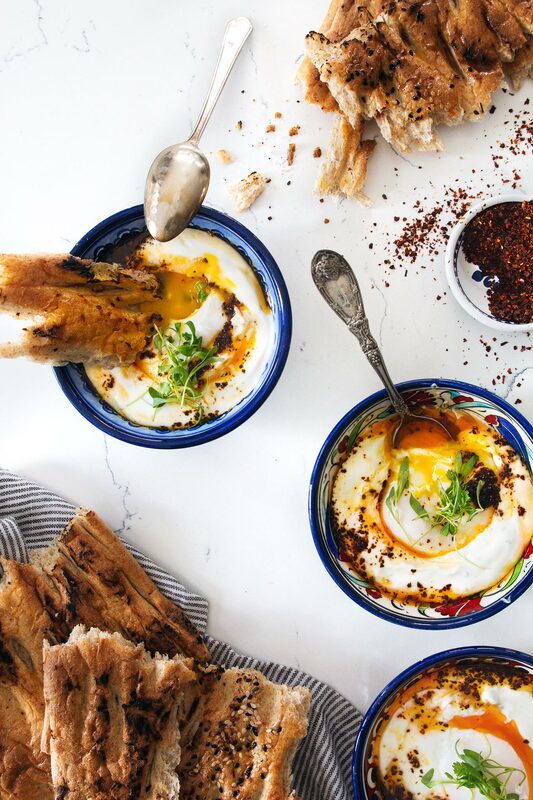 Crack eggs into individual ramekins or measuring cups. Boil salted water in a saucepan. Reduce the heat to a light simmer, add vinegar and create a whirlpool by swirling the water with a spoon in one direction. 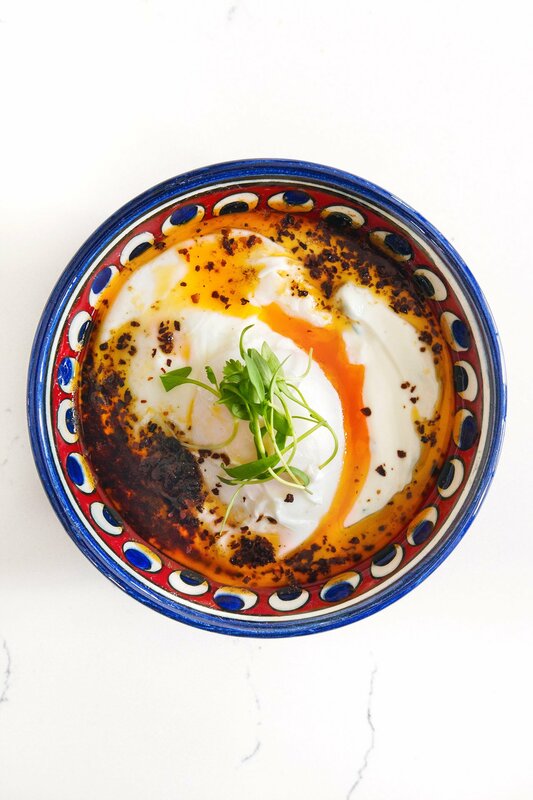 Slide an egg into the middle of the saucepan and cook for 3 minutes. Remove the egg with a slotted spoon and place on a place with paper towels. Season with salt and pepper. Continue cooking the rest of the 3 eggs. In a small saucepan, melt butter. Add the Aleppo pepper and a generous pinch of salt. Divide the yogurt into four bowls. Place an egg on top and drizzle Aleppo butter over the top. Top with microgreens or chopped cilantro. Hey! That Turkish style bread is very nice looking is it homemade? Great! So glad you tried and liked it! yup, making this on Sunday.